31.03.2012: Welcome to the March 2012 edition of the Cubed3 Nintendo Podcast, our Nintendo 64 feature special on all things retro. 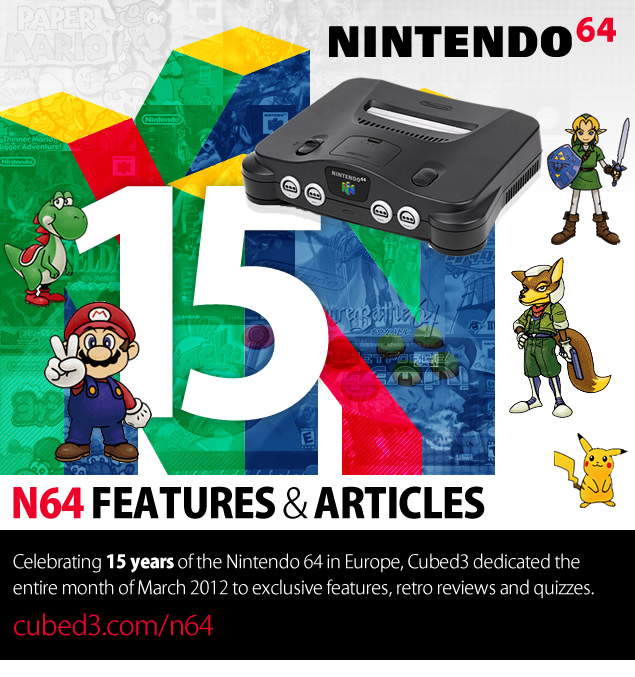 31.03.2012: In our final part of our feature, the Cubed3 team take the lid off our Top 5 Nintendo 64 games. Do you agree? 31.03.2012: Now it's all about the fans - paintings, drawings, crafts, digital work all with a Nintendo 64 flavour in our Art@C3 special. 31.03.2012: Who remembers the Cubed3 Distorted Image contests? Well they're back in our Nintendo 64 Month special. Can you uncover these games? 30.03.2012: As Nintendo 64 month draws to a close, Cubed3 takes a look at one of the biggest releases on the system, Donkey Kong 64. 29.03.2012: It's down to these extra special compositions to reignite those warm retro feelings as Cubed3 arrives at its top 5 soundtracks. 28.03.2012: Cubed3 takes a look at another long lost Nintendo 64 project, in the form of Ape Studio’s Mother 3, or Earthbound 64 to Westerners. 27.03.2012: One of the many masterpieces Rareware developed joins the Nintendo 64 month fun in this Cubed3 review. 26.03.2012: We've looked back at classic N64 tv adverts for the last three weeks and are now down to the final five for your viewing pleasure. 25.03.2012: Remember Star Fox Adventures? Did you know it originated on the Nintendo 64 without Nintendo's famous space crew? 24.03.2012: It's all about the music in our next quiz as part of Nintendo 64 month. The era had fabulous tunes, but do you remember them? 22.03.2012: As we approach the end of our month long Nintendo 64 anniversary celebrations, we need your fan creations! 22.03.2012: They just don't make them like they used to. Check out five more quirky, funny and downright bizzare Nintendo 64 adverts. 21.03.2012: For Nintendo 64 Month Cubed3 will be looking at certain cancelled projects from the 64-Bit platform, the first of which is RiQa. 20.03.2012: Continuing Cubed3's N64 month, it is time to take a look back at one of the lesser known Rare classics on the system. 19.03.2012: Let's start the week with a handful of classic Nintendo 64 tunes in the third part of Cubed3's Top 20 Soundtracks. Nintendo 64 Quiz #3: Win 5 Stars! 18.03.2012: Test your eyes in the third of our Nintendo 64 Month quizzes. Box-arts and screenshots, can you put your retro skills to the test? 17.03.2012: We're deep into March and fast approaching the top 5 titles in our essential, but not definitive, selection of Nintendo 64 greats. 15.03.2012: The Cubed3 Team take a look at five more classic Nintendo 64 adverts as part of a month long celebration on all things N64. 14.03.2012: Cubed3 has explored Japanese Nintendo 64 box-art and is now reminiscing with a selection closer to home as part of Nintendo 64 month. 13.03.2012: As Cubed3 revisits old classics on Nintendo 64, we take a look back at the last Mystical Ninja game to be released outside Japan. 12.03.2012: The Cubed3 team once again embraces the Nintendo 64 sound cores, bringing more classic must-hear jingles and themes. Nintendo 64 Quiz #2: Win 5 Stars! 11.03.2012: Dig into the deepest regions of your gaming memory and test your skills in the second of our Nintendo 64 month quizzes. 10.03.2012: The Cubed3 Top 20 Nintendo 64 games selection continues with a rundown of 15 to 11, including Jet Force Gemini and Mario Tennis. 09.03.2012: As part of Nintendo 64 month, Adam Riley explores the origins of the enigmatic King Dedede from the Kirby series. 08.03.2012: After many hours spent gorging on classic television moments, the Cubed3 team put together twenty must-see Nintendo 64 adverts. 07.03.2012: As part of Nintendo 64 month, Cubed3 takes a look at some of the most impressive Japanese N64 box arts. 06.03.2012: Part of Cubed3’s celebration for the 15th anniversary of the Nintendo 64 includes a look back at Rareware's landmark title, Banjo Kazooie. 05.03.2012: We re-entered a world full of bouncing bass, seductive strings and perky piano to pick out twenty essential soundtracks you must hear. Nintendo 64 Quiz #1: Win 5 Stars! 04.03.2012: Fancy digging into the deepest regions of your memory and testing your Nintendo 64 knowledge? You can win up to 5 Cubed3 Stars! 03.03.2012: The Cubed3 team scavenged through our collections with retro lust to produce our selection of Top 20 Nintendo 64 greats. 02.03.2012: We begin Nintendo 64 month by digging up our dust-covered diaries and divulging some of the best moments during the N64 era. 01.03.2012: We're celebrating fifteen years of the Nintendo 64 with a month dedicated to one of the Japanese giant's finest eras of gaming.